India is a diesel-deficit nation and demand has far outstripped supply. India's diesel production will not be able to keep pace with the rapidly growing demand. Government's pricing policy now allows oil companies to decide prices. Diesel is not much cheaper than petrol any more. Diesel demand in the country is growing at an annual rate of 8%. At this rate India will need a brand new 9 Million Tons per year refinery every year. The automobiles industry has estimated that the share of diesel vehicles, in overall vehicle sales has crossed the 40% mark. The price of fuels is now going to be in line with price of crude oil. Hence the Petrol and Diesel prices are now in line with international price levels, which makes biofuel economically attractive. Setting the stage for manufacturing of vehicle engines that can ply on 100% bio-diesel soon, the road transport ministry came out with draft notification for mass emission standards for such vehicles in India. These will be known as “B100″ vehicles like that of BS-III or BS-IV. Bio-diesel is both renewable and less polluting in comparison to diesel. B100 vehicles have been plying in Brazil and cities such as California and Berkeley in United States. The move aims at reducing dependence on import of crude oil and also to help reduce vehicular pollution. Nearly 80% of diesel is used only for transportation purposes in India. The ministry has also included the standards for test requirements for type approval and extension for four-wheeled and three-wheeled vehicles using both B100 and diesel as fuel, or either of the two. The newly manufactured vehicles fitted with compression ignition engine compatible to run on diesel or mixture of bio-diesel up to 100% bio-diesel will be type approved as per the prevailing diesel emission standards. “After receiving and going through the suggestions and objections, we will come out with final notification. The manufacturers can then make engines that can run on the clear fuel,” said a road transport ministry official. 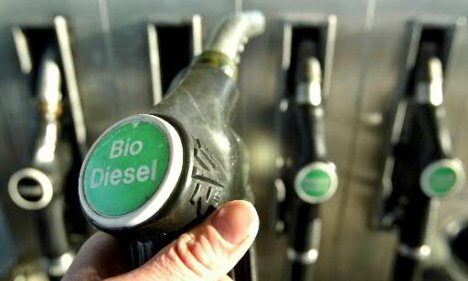 According to the draft notification, the compatibility of vehicle to level of bio-diesel blend will be defined by the vehicle manufacturer and the same will also be displayed on the vehicle. Sources said that quite a few vehicle manufacturers are keen to produce such engines, which they are already doing for other countries. In an official release, ministry said that the new standards and specifications allowing such vehicles will provide alternate source of income to the farmers and the forest dwellers, who can cultivate jatropha and other non-edible oilseeds. These standards have been long awaited by the industry especially those manufacturing bio-diesel and will provide alternate source of income to the farmers and the forest dwellers. Carbon dioxide produced from bio-diesel combustion does not contribute to new emissions of CO2 as it is part of the carbon cycle. Closed carbon cycle - 80% reduction in CO2. Example: growing oil feed stock consumes four to six times more CO2 than biodiesel exhaust. Biodiesel is a safe alternative fuel to replace traditional petroleum diesel. It has high-lubricity, is a clean-burning fuel and can be a fuel component for use in existing, unmodified diesel engines. This means that no retrofits are necessary when using biodiesel fuel in any diesel powered combustion engine. It is the only alternative fuel that offers such convenience. Biodiesel acts like petroleum diesel, but produces less air pollution, comes from renewable sources, is biodegradable and is safer for the environment. Producing biodiesel fuels can help create local economic revitalization and local environmental benefits. Many groups interested in promoting the use of biodiesel already exist at the local, state and national level.